Unknown dates between 28-oct-1951 and 3-nov-1951. Probably Radio Broadcast via station WMEX. 1 Billie's blues (I love my man) BC - Disco S4171 / Monmouth MES 7046 / LDB.08 / JUTB 3039 3'06"
2 Lover man (oh, where can you be?) BC - Disco S4171 / Monmouth MES 7046 / LDB.08 / JUTB 3039 2'21"
3 Them there eyes BC - Disco S4171 / Monmouth MES 7046 / LDB.08 / JUTB 3039 1'45"
4 My man BC - Disco S4171 / Monmouth MES 7046 / LDB.08 / JUTB 3039 3'28"
5 I cover the waterfront BC - Disco S4171 / Monmouth MES 7046 / LDB.08 / JUTB 3039 3'33"
6 Crazy he calls me BC - Disco S4171 / Monmouth MES 7046 / LDB.08 / JUTB 3039 2'13"
7 Lover come back to me BC - Disco S4171 / Monmouth MES 7046 / LDB.08 / JUTB 3039 2'40"
8 Detour ahead BC - Disco S4171 / Monmouth MES 7046 / LDB.08 / JUTB 3039 2'29"
9 Strange fruit BC - Disco S4171 / Monmouth MES 7046 / LDB.08 / JUTB 3039 3'27"
10 Ain't nobody's business if I do BC - Disco S4171 / Monmouth MES 7046 / LDB.08 / JUTB 3039 3'04"
11 All of me BC - Disco S4171 / Monmouth MES 7046 / LDB.08 / JUTB 3039 1'48"
12 (I love you) Porgy BC - Disco S4171 / Monmouth MES 7046 / LDB.08 / JUTB 3039 3'12"
BC - Disco S4171 / Monmouth MES 7046 / LDB.08 / JUTB 3039 1'58"
(St. Clair 5711) 5? 4? (CD.no. 3898392) 3 4 2? 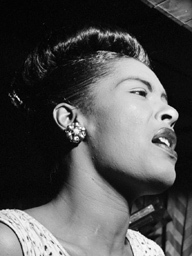 7 The Real “Lady Day” Sings The Blues.